The professional chef's kitchen is a joy – they can come and cook for you for just one special night or cater more substantially – there is also a guests kitchen also well equipped and lots of private sitting areas when you need to get away from the rest of the family and enjoy some holiday reading. It has 6 spacious bedrooms two on the ground floor one of which has direct access to the garden, the first floor has the other 4 suites with living areas and galleried bedrooms - all bedrooms are en-suite. The first floor also has a large library from where you can walk out on to the sea view terraces. The villa location is wonderful - Zaton is a picturesque and charming little village in a bay, perfect for relaxing in the sunshine and swimming in the sea. It has little pebbly beaches and swimming spots, and plenty of pine trees for shade – it’s really pleasant to walk along the shore or just to sit in one of the little sea-front restaurants sipping a glass of local wine! The sea in Zaton is a particularly vivid colour and Zaton was a favourite of the old Dubrovnik aristocratic families who used to holiday there. 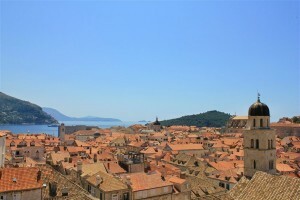 The villa is also only short drive from the ancient walled city of Dubrovnik so if you get bored of lounging around the pool or bathing in the sea, and having fresh fish BBQs then you can sight see, shop or eat in the stunning old town or take a trip to one of the nearby islands. Dubrovnik is the most well known destination on the Dubrovnik Riviera with its famous medieval walled town, but there are many other beautiful and interesting places worth a visit like Cavtat, Konavle, Mlini, the Elaphiti islands of Kolocep and Lopud, The Peljesac Peninsula, The Islands of Korcula and Mljet… Great food, stunning views and wonderful sea-side locations and beaches – this is a real gem. Other information: Minimum stay: 7 days from June to September, 5 days minimum in other periods. Day of arrival: Please enquire. Short stays possible: on request. Check in: from 17:00 hours. Check out: by 10:00 hours. The price includes:Tourist tax, VAT, housekeeping, daily cleaning, welcome pack, bathroom amenities, pool maintenance, house manager at disposal, private concierge.